At Vytec, we take our business seriously. It’s the way we’ve approached things since we first opened our doors for business in 1962. 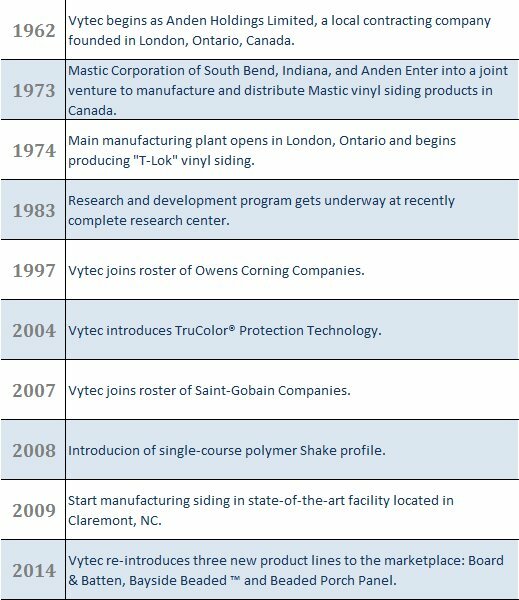 Since then, Vytec Corporation has been a leading manufacturer of top quality, innovative, vinyl siding products. To us, vinyl siding isn’t just a commodity. It’s a precision product. That’s why we design, formulate and precision-engineer our full line of products to meet or exceed the highest standards in the industry. That commitment makes us one of the few siding manufacturers to satisfy the requirements of both the Underwriter’s Laboratories® and the Vinyl Siding Institute. When we say a panel is .044 inches thick, it is. Every time. It’s this performance-thinking attitude that distinguishes Vytec from all other siding products and has helped us earn the respect of remodelers, builders and homeowners worldwide. Today, we continue to expand our presence in the United States and Canada. Our growth is a testament to customer satisfaction, our continuing success in product innovation, and our commitment to service after the sale. When we say Vytec meets or exceeds the expectations of its customers, we’re really talking about three different groups — distributors, dealer/installers and homeowners. Each with very different expectations. Whether you’re a distributor worried about on-time delivery, a dealer/installer focused on ease of installation or a homeowner concerned about warranty, rest assured. You can rely on the Vytec commitment to quality, service and integrity. It’s at the heart of everything we do.